Get your New Year’s resolution Talking Mat here! Talking Mats is a social enterprise whose vision is to improve the lives of people with communication difficulties. 2015 has been another exciting year for us. We have had great opportunities to work with a fantastic range of people and hear great stories: from wee ones in nurseries using Talking Mats to encourage active participation and decision making, to older people and their families through our dementia family training project. It is our core belief that good communication is fundamental to a quality service. Making sure there is space for active listening to views and concerns particularly, if individuals have difficulties communicating is central to effective interactions and individualised, person centered care. We are really grateful to all the people who have supported the work of Talking Mats; people with communication support needs, staff who work with them and organisations that we are privileged to work with on a consultancy basis. • What are you definitely going to go for ? 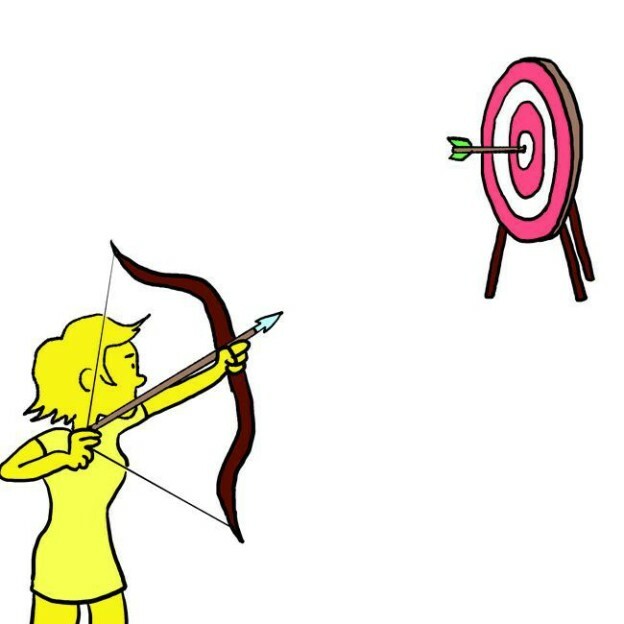 • What is not a goal for you in 2016 . • Don’t forget to use the blanks to personalize it further! • Plus take a photo so you can reflect back on where 2016 takes you and whether you achieved your goals . This entry was posted in Blog, Communication difficulties, Participation, Personalisation and tagged Communication difficulties, Participation, Personalisation, Talking Mats on December 30, 2015 by Lois Cameron. Fika (coffee time) in the Talking Mats office is always interesting. Recently we got chatting about Christmas preparations and who had the longest ‘to do’ list. There was a definite variation in enthusiasm for all things Christmas. We needed to do a Talking Mat! 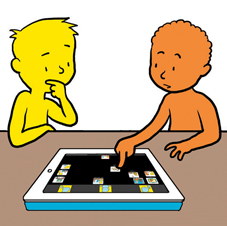 This was done on our digital Talking Mats – it’s easy to import your own images now and make a digital Talking Mat about any topic. Eating , drinking and games and puzzles got the thumbs up! (Lois is the games queen and was the most enthusiastic about that). Holiday, partying and entertaining got consensus. Shopping was in the mid section-we all agreed. Perhaps by now it would be less positive with last minute mayhem. Gifts was added as a blank (how could the interviewer forget that) and not everyone was comfortable about the commercialisation of Christmas. ‘How do you feel about Juggling demands?’ We all agreed -not sure. Again remember, Talking Mats is how a person feels at a certain point in time. Ask us again on Christmas Eve?! 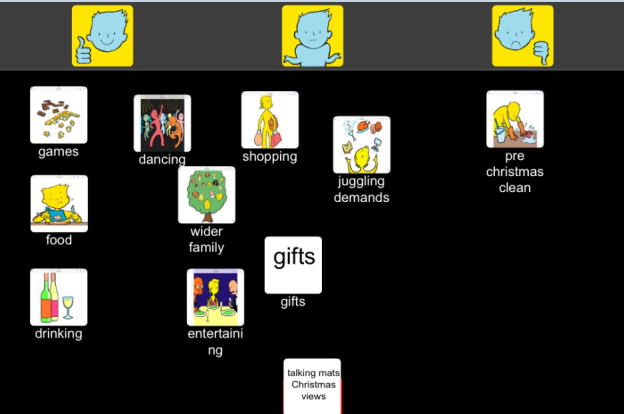 This entry was posted in Blog, Communication difficulties, Digital Talking Mats, Participation, Personalisation and tagged App, Communication difficulties, digital, Participation, Talking Mats on December 18, 2015 by Rhona Matthews. We are delighted that Nick Stewart, Director, Software and Products with Arum Systems, the IT Consultancy who have built the Digital Talking Mats has chosen TM as his favourite project for a case study. Here is an extract from his case study describing the Challenge and Process of working with Talking Mats. The challenge was taking the existing physical Talking Mats tool and building a digital application suitable for multiple platforms, while maintaining the core ethos of the tool. A significant amount of academic research went into creating the physical product and those principles had to be present in a digital version. The applications had to be extremely intuitive to use and enable better conversations for people with communication difficulties. The aim was to create 3 digital versions; a browser based version for laptop users and a tablet version for iPad users and Android users. Each application would connect to a cloud server, allowing users to log in from any device, and the tablet versions would allow offline working through syncing with the cloud when a connection was available. There was a requirement to set up a multi-tiered subscription based user account system to match the intended charging model for the digital app. Arum’s approach was to totally immerse ourselves in the Talking Mats business to understand their goals, ethos and objectives. We took time to learn how the Talking Mats ecosystem worked and how they wanted to engage with their customers. By applying our 3D Methodology we were able to break down the deliverables into phases allowing the key building blocks to be delivered first. This also allowed the best use of budget and reduced the time to market the new product. This entry was posted in App, Blog, Communication difficulties, Digital Talking Mats, Talking Mats principles and tagged AAC, App, digital, Talking Mats on December 11, 2015 by Joan Murphy.